Bryan Independent School District, located in Bryan, TX, has been providing quality public education since 1880. The district, which serves more than 16,000 students, has been renovating and adapting campuses over the past several years to ensure that the schools best serve student populations. 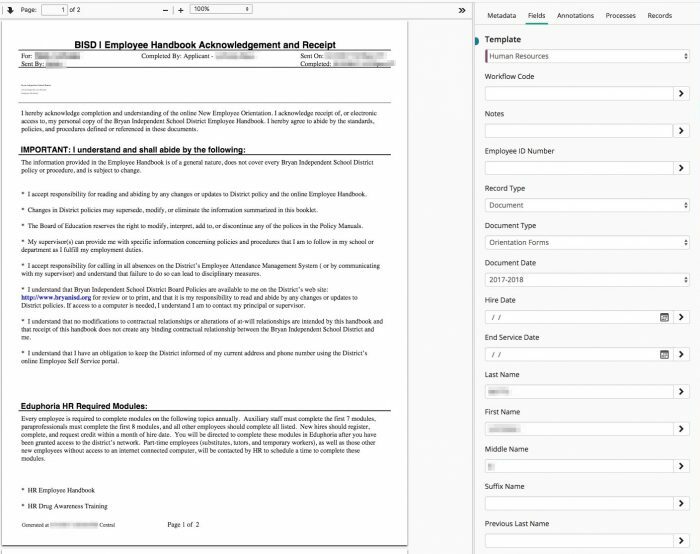 The district previously relied on a paper-driven employee onboarding process. During the district’s busiest period, the district onboards 300 new employees in three months. The process required eleven distinct forms for each licensed employee in addition to copies of documents like I-9 forms and driver licenses. As a result, the process of onboarding took up to an hour and thirty minutes as the new employee reviewed, completed and signed each form. A paper routing sheet was used to track each employee through the hiring process. District staff made copies of the documents and stored them in the appropriate employee files. The paper workload required that the district hire temporary employees to file just HR documents. Bryan ISD used Laserfiche Workflow and the Laserfiche app to transform the HR department as a whole. 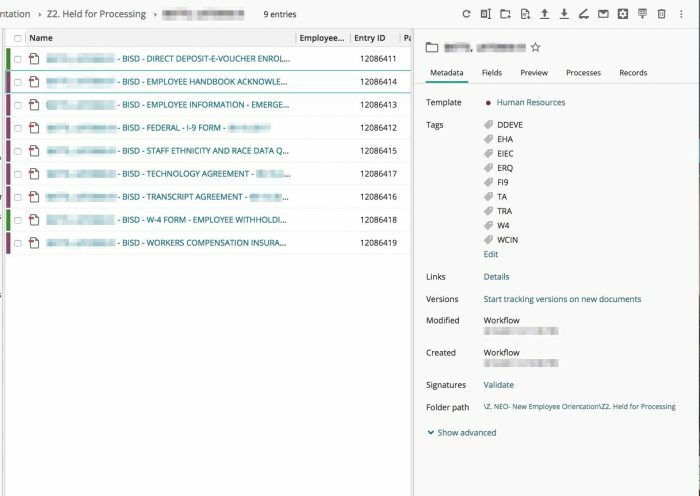 “HR estimates that it has reduced its annual staff costs associated with document management by over $350,000, as compared to the previous paper process,” says John Rokenbrod, Software/Records Analyst at Bryan ISD. Since implementing Laserfiche, the onboarding process is nearly 100 percent paperless. The new process saves up to an hour and thirty minutes per employee, allowing employees to be onboarded almost instantly. 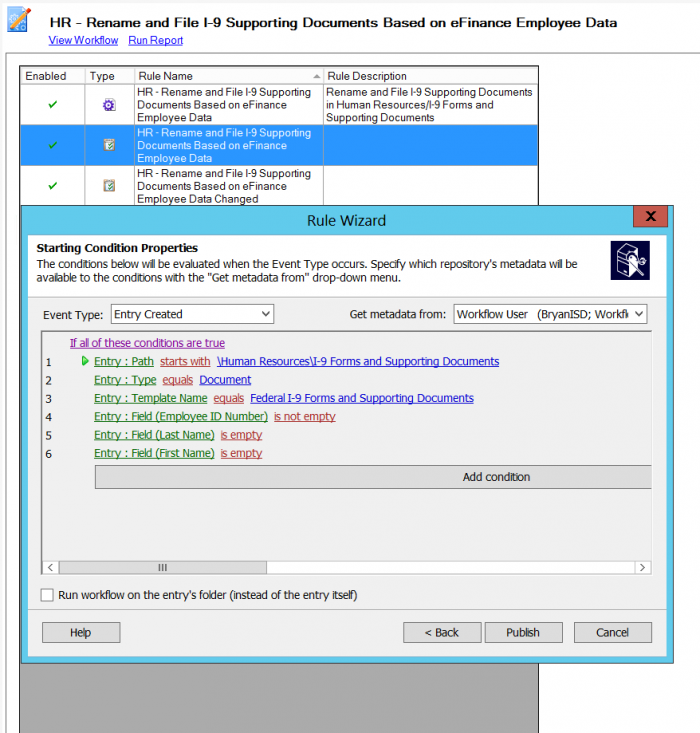 First, an HR staff member creates an employee folder within Laserfiche. Prior to orientation, an HR staff member emails the new employee a link to the onboarding forms located on a third party vendor site. This allows employees to complete forms whenever is most convenient, and allows district staff to contact employees prior to orientation to correct incomplete or incorrect forms. The vendor sends newly completed forms to the district multiple times a day and Import Agent picks them up from a district server. Workflow stores these forms in a temporary folder where they are processed. An HR staff member verifies the content in the forms and changes the value of a metadata field to indicate where Workflow should route them. Workflow applies descriptive tags to the main folder, allowing staff to easily see which documents have been added. For documents that the district cannot create electronically (e.g. 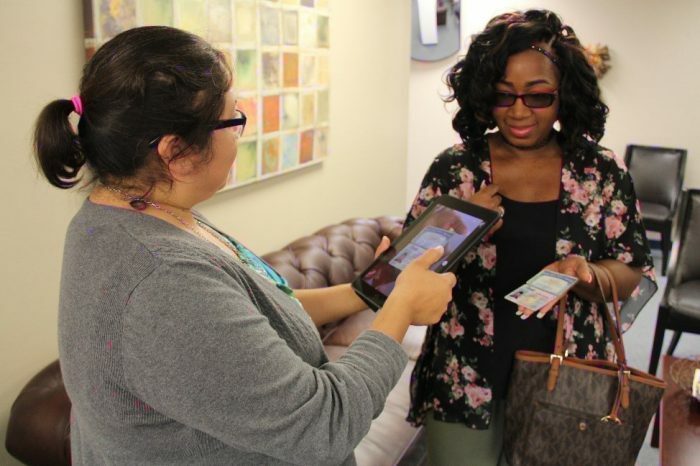 I-9 forms, driver’s licenses or certificates), the district uses the Laserfiche app on an iPad to take photos of the documents during the new employee’s on-site orientation. These photos are stored in a separate Laserfiche folder due to different retention requirements. 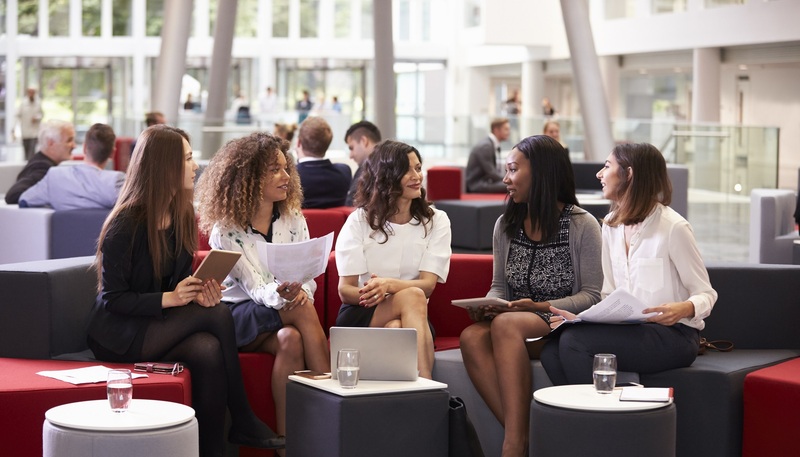 An integration with the district’s employee database allows many fields to be auto-populated, saving time for employees and ensuring that information is accurate. 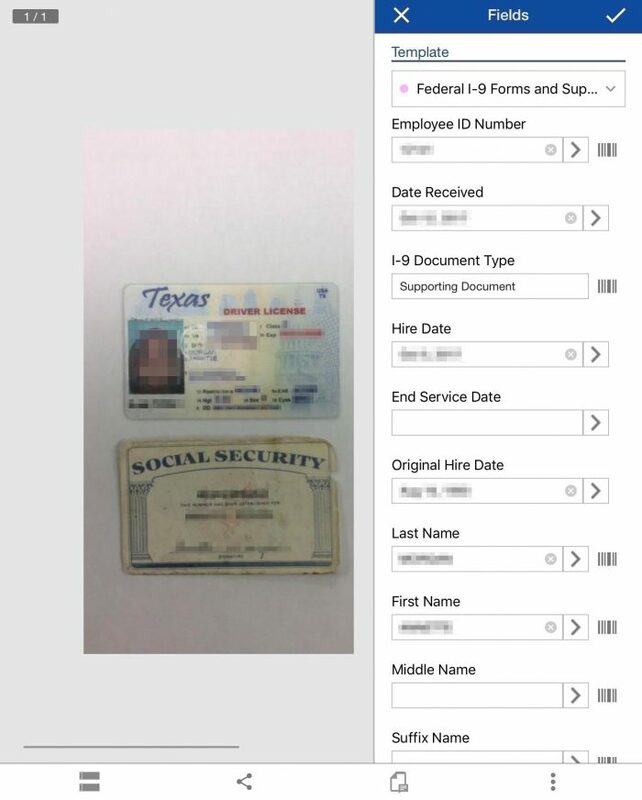 Workflow performs a lookup to the database using the employee ID number. 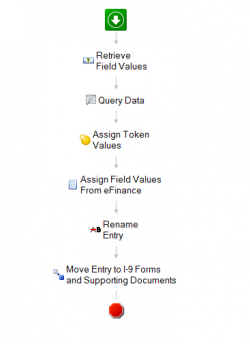 The lookup allows Workflow to populate the first and last name metadata fields as well as other information that may exist in the system.